CLEVELAND, Ohio (January 10th, 2012) Brite WINTER will return to Ohio City's Market District on February 16th 2013 with a continued focus on art and music to warm the winter spirit. The festival, now in its 4th year, is a growing showcase of some of Ohio's best artistic talent along with up and coming artists from across the midwest. In 2012 the festival grew to an unprecedented 10,000 attendees showcasing 15 art installations and 40 acts across 8 stages. The Brite WINTERl steering committee plans to continue the vision in 2013 by expansion of the programming South of Lorain Avenue or 'SoLo' and supporting the growth of the free festival via more sponsors and partners. 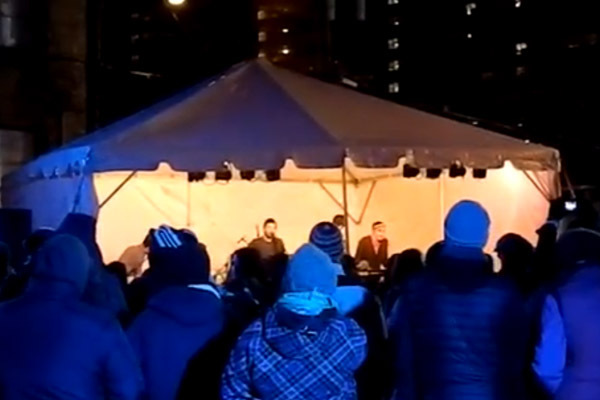 The guiding idea of Brite WINTER is to explore and play outside in the wintertime therefore the festival has always featured an outdoor stage for bands to perform wearing stocking caps and mittens with holes cut in the top. In 2013 there will be an outdoor stage at the main festival grounds and a second outdoor stage behind Campbell's Sweets Factory in the SoLo location. Other stage locations include Joy Machines Bike Shop, Market Ave. Wine Bar, The Cleveland Hostel and The Loren Naji Gallery. 48 bands are scheduled to play between the hours of 4pm and 1am on February 16th, with a diverse cross section of indie, rock, punk, folk, soul, electronic and acoustic acts curated by the festival's booking partner Bad Racket Recording Studio. The partnership for music production at Brite WINTER also includes Vertical Sound, a premium live sound production company invested in Cleveland, and a welcome new player to the Cleveland music landscape, 87.7 Cleveland’s Sound. “87.7 is a radio station for Clevelander's by Clevelanders. I've been watching them grow since the summer and I couldn't be happier about having them in town, they play great tunes, low on the dial – high on music” says Thomas Fox, festival Co-Chair and partner at Bad Racket Recording Studio. 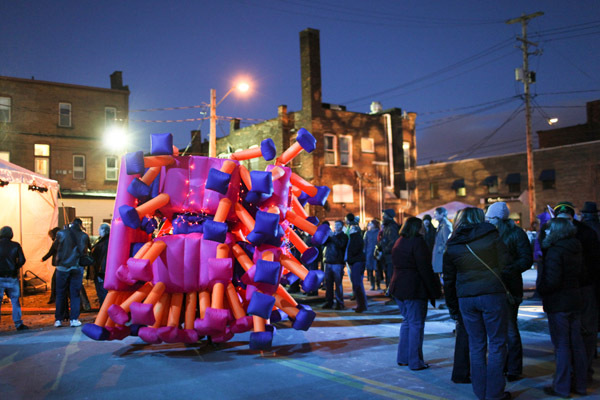 While Brite WINTER is a huge music showcase, more than half the festival is about lights, arts and games. 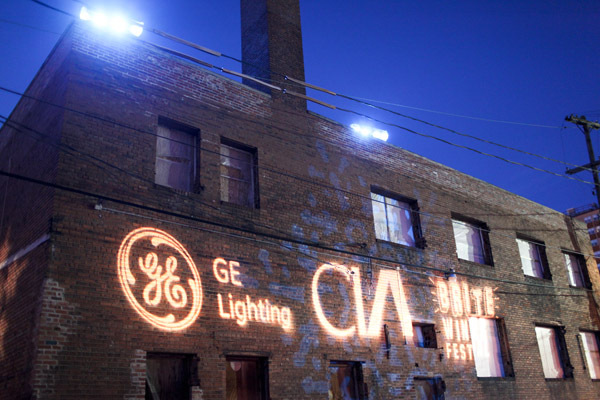 For the second year in a row GE Lighting has backed the festival with thousands of high energy efficiency lights for artists to create brilliantly lit art installations for festival go-ers to enjoy. “This year we're sticking to light and fire, That's what Brite Winter Art is always about. We want the art installations to rely on that basic ethos.” Say's Emily Hornack, Co-Chair of Brite WINTER. This year there will be between 15 and 20 individual art installations created through partnership with The Cleveland Institute of Art, The Cleveland Museum of Art's Department of Community Affairs, and sponsored by Cleveland State University, Old Angle Tavern, ABC The Tavern, Orange Blossom Press, and several more local businesses. The site of Brite WINTER has moved since the original festival in 2010, but every year there is something familiar, a 24 foot long giant wooden skeeball ramp. In 2013 the now famous Giant Skeeball will be joined by some new games and activities put together by RGI international and the Cleveland Disc Alliance. Brite WINTER is about playing outside. The small steering committee comprised of volunteers with backgrounds from various Cleveland Universities work on the festival year round to make winter the most enjoyable time of year in Northeast Ohio. Funding for the festival comes primarily through businesses of all sizes, from Cargill and RTA to Light Bistro and Giffen & Kiminsky Law, the business community of Cleveland has recognized value in shifting our perspective to include our winter season. Even with the support of more and more businesses in the community, this festival remains a grass roots effort with hundreds of individuals in Cleveland pledging their support to help the idea of Brite WINTER grow each year. In 2012 $3,000 was raised through community efforts on the Kickstarter online fundraising platform, and over 120 volunteers pitched to run the event on the day of the festival. This support is pivotal to the identity and mission of Brite WINTER. The 2013 individual Kickstarter will begin the week of January 14th. For more information about the Kickstarter and the volunteer opportunity, follow the festival's Facebook and Twitter accounts or check Britewinter.com for details. Brite WINTER 2013: Cleveland’s 4th Annual Winter, Art, and Music Celebration. The community-organized Brite WINTER festival takes place in the Ohio City Market District, on Saturday February 16th2013. Entrance is free and open to the public of all ages. The festival is run by a volunteer steering committee, and is supported by in-kind donations and sponsorships from Cleveland businesses, organizations, and universities. Jimmy Kuenhle: The giant dancing inflatable Brite Winter noodle monster was a huge hit amongst people of all ages at Brite Winter 2012. Jimmy Kuenhle, of the Cleveland Institute of Art will be returning to the festival in 2013. 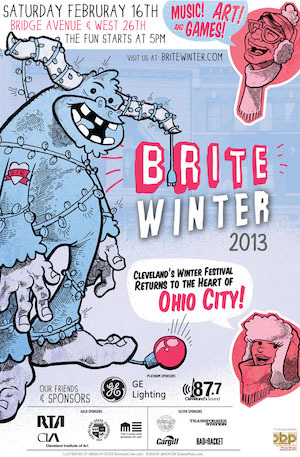 Sponsors: Brite Winter remains a free and open gated festival through the support of our sponsors.